Hawthorn star Jarryd Roughead will undergo immunotherapy treatment over the next year. HAWTHORN star Jarryd Roughead will undergo immunotherapy treatment over the next year to treat his cancer. 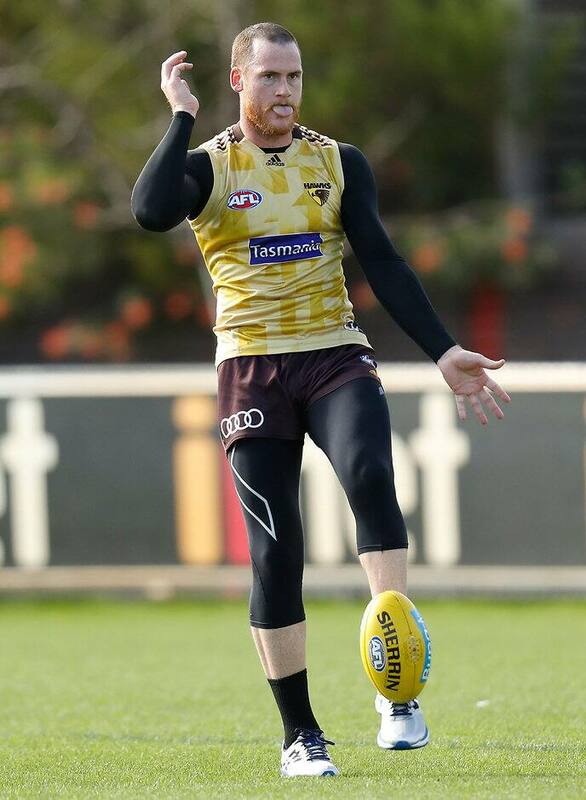 Roughead's melanoma, which first appeared on his lip last season and forced him to miss two games, has returned and spread internally. Roughead has four small spots on his lung and a biopsy last week confirmed a diagnosis of melanoma. The advantages of Roughead's treatment is he won't have to undergo chemotherapy and suffer those side effects. The 29-year-old will start treatment next week, which will go for 12 months. "When the news hit two weeks ago it was shock and I didn't really believe it," Roughead told a media conference on Tuesday. "Now we've had the biopsy and seen the doctors it was 'Righto, let's get going'." Roughead said he would remain around the football club and travel with his teammates this season as he undergoes his treatment. "I'm not feeling down at the moment, because I know what I have to do. It's not like I'm going anywhere," he said. Roughead has met with world-leading specialists at the Peter MacCallum Cancer Centre and is confident of making a full recovery given the recent advances in treatment. "I understand the drugs that we need to use are very, very good and the percentages are very good," Roughead said. "I'm still going to be out here (at the club), I'm still going to be going on trips … so it's not as if I have to go away, I don't lose my hair. "Nothing like that happens. I'm still just going to be the same old me, but unfortunately I just can't play." The popular Hawk won't have to undergo traditional chemotherapy and suffer the typical side effects. However, club doctor Michael Makdissi said the disadvantage of Roughead's injection treatment was that side effects were unknown. "We go there expecting a really good result and he's a young, fit bloke, hopefully he tolerates it really well," Makdissi said. "We're hoping that he's here, part of training and being involved. Obviously there'll be periods where he's feeling a bit down and flat, in which case we'll back off a little bit. "We don't want to push it to a point where we're really stressing the body, so it's no games, no full-on activity, but he'll be here and part of what's going on." Makdissi said medicos were "optimistic with the outcome" from Roughead's treatment.